(1) “Application” means a complete Project Plan submission satisfying the requirements of this Chapter. (2) “Building” means a multi-family residential building containing three or more Dwelling Units, or three (3) or more attached Dwelling Units. (3) “CC&Rs” means covenants, conditions, and restrictions. (4) “Common Area” means Project areas that are commonly owned and/or commonly used by Project residents, that allow for recreational and leisure activities, that are located generally interior to and between Buildings, and that are not Open Space. Areas and items not included in Common Area include parking areas, roadways, dumpster pads and enclosures, equipment pads, and other developed, non-landscaped areas. See Figure 1 for examples of Common Area. (5) “Context and Setting” means that set of existing natural and manmade landmarks and structures adjacent to and near a proposed Project. (6) “Department” means the Community Development Department or successor department. (8) “Director” means the director of the Community Development Department, or designee. 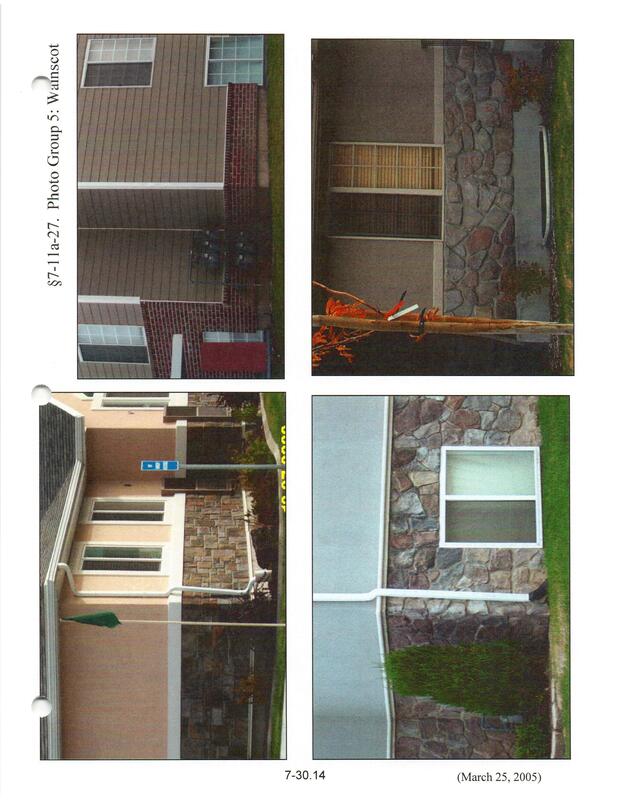 (10) “Dwelling Unit” has the same meaning as Tooele City Code §7-1-5, as amended. 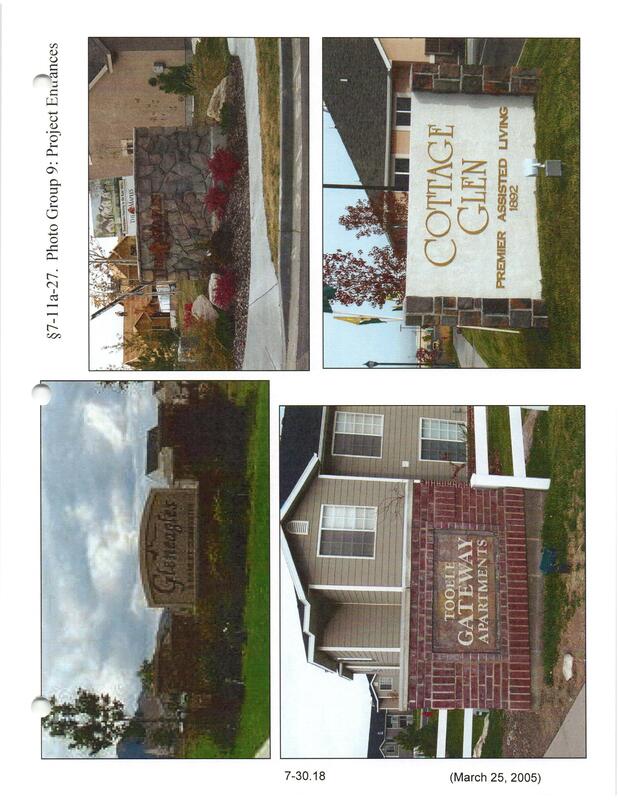 (12) “General Plan” means the 1998 Tooele City General Plan and its various infrastructure elements, as amended, including culinary water, sanitary sewer, storm water, rights-of-way, transportation, parks and recreation, trails, police and fire, affordable housing, and land use. 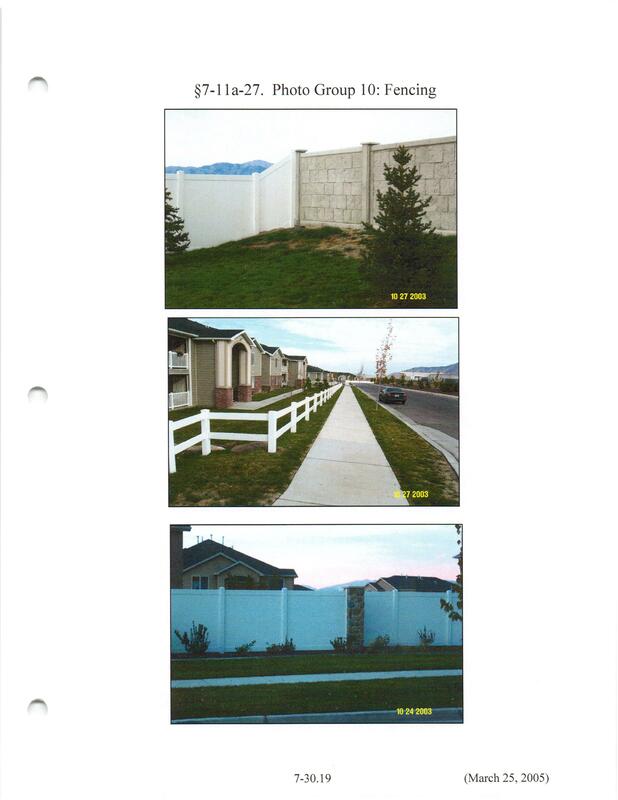 (13) “Land Use Plan” means the Land Use Element of the 1998 Tooele City General Plan. (14) “Landmarks” means off-Project items or structures of visual prominence that are associated with a certain geographic area or development. (15) “Multi-Family” means residential development containing three (3) or more Dwelling Units per Building, or three (3) or more attached Dwelling Units. (16) “Net Developable Area” means the entire Site minus areas dedicated for public rights-of-way, interior roads, dumpster enclosures, and pathways. (17) “Open Space” means Project Site areas that are located generally outside of Buildings, between Buildings and the Project perimeter, and that are not Common Area. Areas and items not included in Common Area include parking areas, roadways, dumpster pads and enclosures, equipment pads, and other developed, non-landscaped areas. 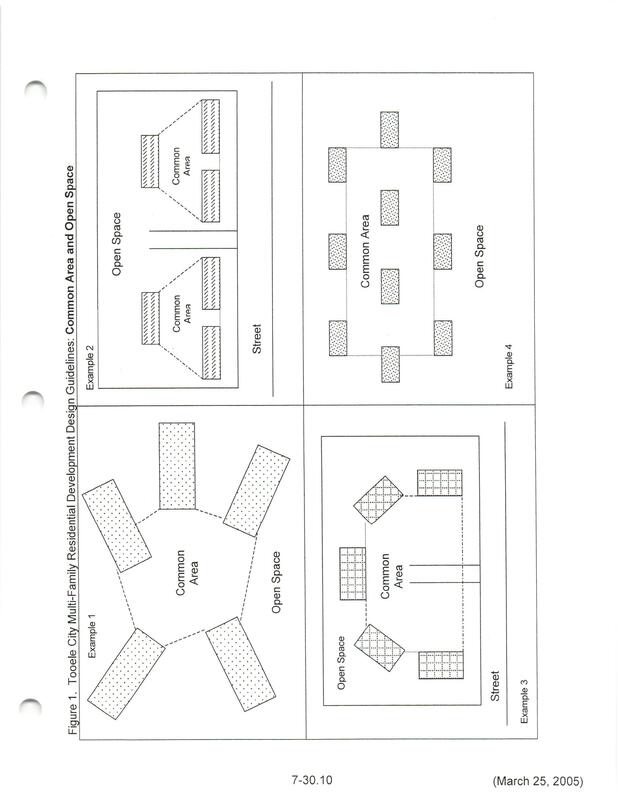 See Figure 1 for examples of Open Space. (18) “Pre-existing” means in place or in effect prior to the date of Project Application. (19) “Project” means a Multi-Family residential development project, including, but not limited to, Buildings, Common Area, and Open Space. (20) “Project Plan” means that set of documents comprising an Application for a Multi-Family residential development Project, including, but not limited to, all information and documents required by this Chapter. 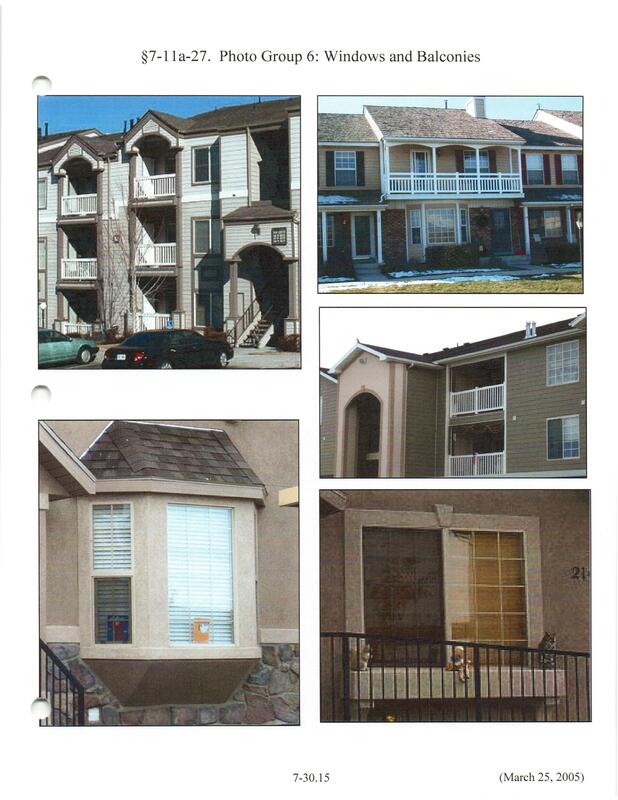 (23) “Standards” means the Multi-Family Residential Design Standards contained in this Chapter. (24) “Surrounding Property” means all properties touching or adjacent to, or abutting a street adjacent to, a Project. (1) “Alcove” means a recess or small room connected to or forming part of a larger room. (2) “Arch” means a curved structure for spanning an opening, designed to support a vertical load. (3) “Column” means a supporting pillar with cylindrical shaft. (4) “Eave” means the overhanging lower edge of a roof. (5) “Facade” means the front of a building or any of its sides facing a public way or space, esp, one distinguished by its architectural treatment. (6) “Gable” means a triangular section of wall at the end of a pitched roof, or a triangular ornamental seat over a window or door. (7) “Gambrel” means a ridged roof or ornamental openings divided on each side into a shallower slope above a steeper one. (8) “Keystone” means the wedge at the center or top of an arch, serving to lock all of the other wedges into place. (9) “Lintel” means a beam supporting the weight above a door or a window. (10) “Pediment” means a wide, low-pitched gable, usually over an entry. (11) “Pier” means a vertical support structure such as a wall between two openings. (12) “Pilaster” means a rectangular column, projecting slightly from the wall. (13) “Pillar” means an upright, relatively slender shaft or structure used as a support or standing alone as a monument. (14) “Porch” means an exterior appendage to a building forming a covered approach or vestibule to a doorway. (15) “Portico” means a porch or walkway with a roof supported by columns. (16) “Shutter” means a louvered awning which is angled to shade a window form direct sunlight and glare while preserving the outside view and admitting soft, diffused light. (17) “Trim” means a finished woodwork or the like used to decorate, border, or protect the edges of openings or surfaces. (18) “Wainscot” means a facing of finish material which typically covers the lower portion of a wall. (a) To achieve the goals and objectives of the General Plan. (b) To implement the policies of the General Plan, including the Principles stated in the Land Use Plan. (c) To guide the general configuration and appearance of Buildings and Projects consistent with the General Plan. (d) To preserve the valuations of Buildings and Projects, as well as the valuations of the Surrounding Properties. (e) To encourage an aesthetic appearance that serves to achieve the goals, objectives, policies, and principles of the General Plan and the Purposes stated in this Chapter. (f) To provide a fair, equitable, and predictable process for the evaluation of Project Applications. (g) To improve the quality of life of Multi- Family residents by improving the quality of Projects and Buildings. (h) To recognize the fact that architectural and design considerations have a significant impact on the quality of life of Multi-Family residents and on property valuations. (i) To recognize the distinct geographic, historical, and other contexts that make Tooele City unique, and to encourage Multi-Family development to do the same through Building and Project design. (j) To protect major vistas and panoramas that give special emphasis to open space, mountains, and manmade or natural Landmarks. (2) The Purposes of the Standards do not include an intent to arbitrarily dictate color, materials, style, theme, and other similar considerations, but to provide reasonable general parameters within which the above Purposes can be fulfilled. (3) Nothing in this Chapter shall be construed to limit the City’s exaction authority. 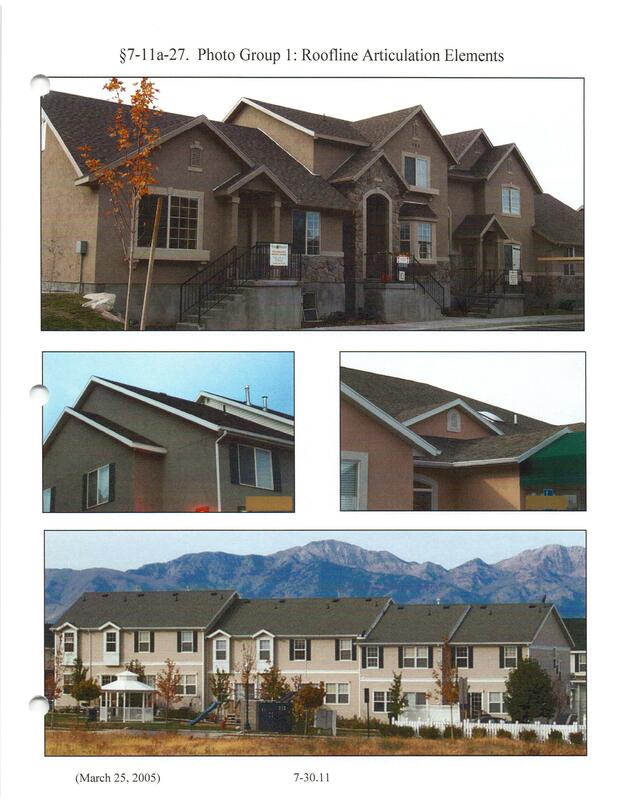 (1) Any person desiring to develop a Multi-Family Project shall submit to the Department a completed Application and Project Plan in conformance with Tooele City Code Chapter 7-11, Site Plan and Design Review. (a) Site plan showing the Project, including the configuration of all Buildings and other improvements. (b) Site plan showing the Project and all existing public improvements, utilities, and structures within a distance of 150 feet from any Project property line. (c) Site plan showing the Project and all existing public improvements, utilities, and structures within a distance of 150 feet from any Project property line. (d) Architectural rendering showing the Project and the configuration of Buildings and other improvements. (e) Architectural rendering showing Building exterior details, including all Design Elements. (f) Architectural rendering showing the Project and all existing public improvements, utilities, and structures within a distance of 150 feet from any Project property line. (g) All Building floor plans anticipated to be used. (l) Pedestrian pathway and wheelchair access plan. (m) Storm water management plan. (n) Form of tenancy agreement, if the Building contains Dwelling Units for lease. (vi) existing and proposed grades with two-foot (2′) contours. (p) Condominium CC&Rs, if the Building contains Dwelling Units for sale. (q) Form of Project common ownership agreement if not covered by the CC&Rs. (r) Other information and documents reasonably required by the Department. (s) All schematics and drawings shall be to a scale of 100 feet to the inch, but additional schematics of higher or lower scales may be submitted. (t) All schematics and drawings shall be on 24″ x 36″ copy or blueline paper. (3) An Application that does not contain all of the information required by this Chapter shall be deemed incomplete, and shall not constitute a Project Plan. (a) The coordination and integration of internal pedestrian, bicycle, and vehicular circulation routes, parking areas, and Building entries. (b) The arrangement and adequacy of on-site and off-street parking. (c) The location and dimensions of dumpsters and other similar structures. (d) The location and dimensions of walls and fences. (e) The coordination of the Project with existing or planned right-of-way alignments and street improvements. (f) Sight distances from and to Project streets and driveways. (a) The manner in which challenges and questions regarding sensitive lands, as defined in Tooele City Code Chapter 7-12, will be avoided, mitigated, or otherwise resolved. (b) The manner in which Project landscaping will conceal or screen unsightly areas. (c) The location and dimensions of hedges and other screen plantings. (d) The manner in which the finish landscaping will be maintained. (e) The manner in which sound and sight buffers will be incorporated for the preservation of views, light, and air, both within the Project and on the Surrounding Property. (f) The manner in which Open Space will be incorporated relative to Buildings, Common Area, parking areas, and internal circulation. (a) The manner in which on-site grading and drainage provides slope and soil stabilization, prevents erosion, and minimizes off-site impact. (b) Plans for soil removal, fill work, retainage, soil stabilization, and erosion control. (c) Plans for plantings, ground covers, and/or shrubbery as a means to prevent dust, stabilize soils, and control erosion. (d) Integration and preservation of existing and proposed storm drainage ways, channels, and culverts. (e) The maintenance of drainageways, channels, and culverts on and through the Project. (a) The incorporation of utility systems in a manner that does not detract from Building or Project appearance. (b) The size, location, and maintenance of service systems. (c) The location of electrical and telephone service systems. (d) The location and screening of transformers and pad-mount mechanical and electrical equipment. (e) The location and sizes of all utility lines, manholes, poles, underground cables, gas lines, wells, and similar installations and facilities. (f) Utility service systems maintenance. (8) At the time of Application, a Project applicant shall pay all site plan review and other fees approved by Resolution of the City Council. (1) Projects shall be designed to as to preserve and incorporate the Site’s natural features and other features contributing to a Project’s Context and Setting, such as, natural grade, natural vegetation, natural storm water and flood channels, major vistas and panoramas (e.g., Oquirrh mountain range; Stansbury mountain range, the Great Salt Lake, and vast open space and agricultural areas), proximity to historical structures and areas, and the Surrounding Property (e.g., zoning, existing development). (2) Projects shall be designed so as to recognize existing natural and manmade Elements and Landmarks, where such Elements and Landmarks are consistent with the Purposes of this Chapter, by including in the Project Plan such Elements as are similar in appearance, design, and purpose. (3) A Project that contains structures significantly larger or smaller than the Surrounding Property shall include Elements at the Project perimeter that provide a transitional effect to the Context and Setting of the Surrounding Property. (4) A Project shall be designed so as to possess a functional relationship of the Project to its Context and Setting. (5) A Project incorporating existing registered historical structures shall utilize the historical features, aesthetic elements, design, and architectural elements in redevelopment. Adjacent projects are encouraged to incorporate the same into adjacent developments. (1) As a general rule, Buildings shall be oriented to the public rights-of-way and to internal circulation systems, in that order of priority. (2) For energy efficiency and resident comfort, Buildings shall be oriented so as to minimize east/west exposures and should utilize landscaping to create shade as a heat control mechanism. (3) Buildings and other structures shall be placed in a manner so as to minimize impairment to lines-of-sight for pedestrian, bicycle, and vehicular traffic. (4) Common Areas shall be located between all Buildings so as to encourage relatively even Building distribution on the Site and to discourage concentration of Buildings on any part of the Site. See Figure 1 for examples of Common Areas and Open Space. (b) Castle-top rise and fall in the roofline. (a) At least one (1) Roofline Articulation Element for Buildings with three (3) or less Dwelling Units on any Building story. (b) At least one (1) additional Roofline Articulation Element for every additional two (2) Dwelling Units above two (2) on any Building story. Example: a Building with five (5) Dwelling Units requires one (1) Roofline Articulation Element for the first three (3) Dwelling Units, and one (1) Roofline Articulation Element for the additional two (2) Dwelling Units. (3) Each roofline stair-step or castle-top rise and/or fall shall be at least twenty-four inches (24″) in height. 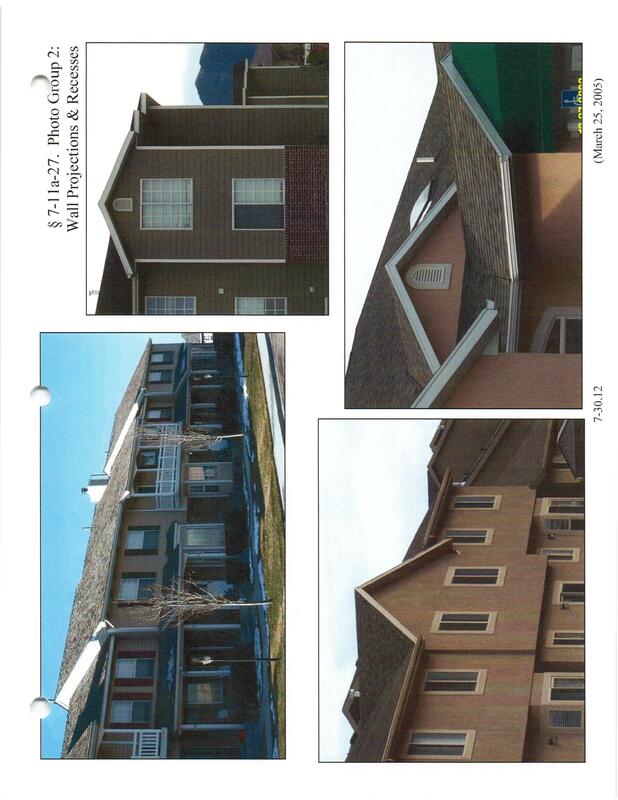 (4) See Photo Group 1 for examples of Roofline Articulation Elements. (5) Rooftop heating, air conditioning, and other mechanical equipment shall be screened from the view of pedestrians or drivers from a horizontal distance of not less than two-hundred feet (200′) from Buildings, at street level, with screening materials, design, and color similar to the supporting rooftop. 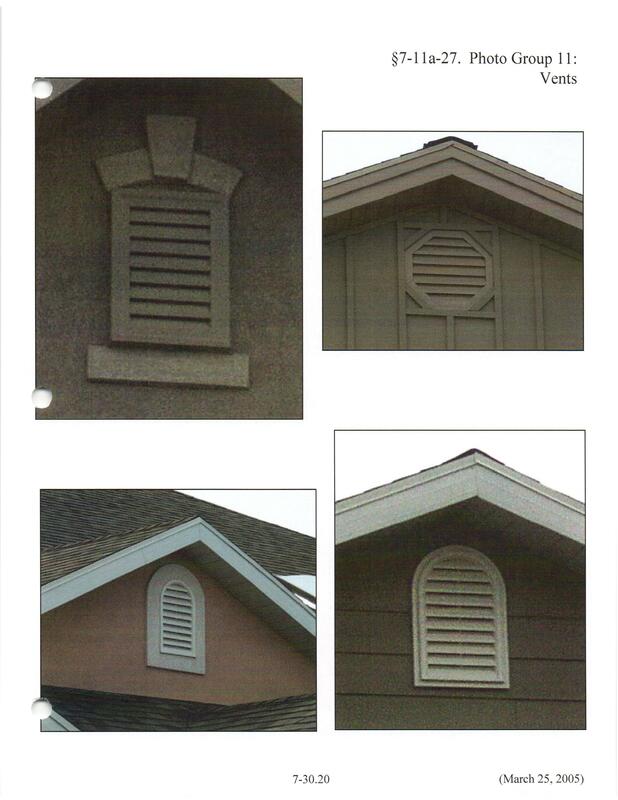 (6) Vent stacks, pipes, and other similar features shall be black or of a color similar to the supporting rooftop. (7) Roofs and gables shall have a slope of at least a 1- to-4 ratio, or 22.5 degrees. Shallower or flat roofs are prohibited. (2) Side Building facades shall be articulated by incorporating wainscot where wainscot is incorporated on any other Building facade, and incorporating at least one (1) windows per dwelling unit, as described in this Section. (3) Wall projections and recesses. See Photo Group 2 for examples. (a) Wall projections and recesses are sections of Building facade that project out from the front horizontal plane of the Building, or recess into the front horizontal plane of the Building. (i) Projecting and recessed facade sections shall be at least as wide as a Dwelling Unit on the first fully or partially above-ground Building floor. (ii) Each facade projection and/or recess shall be at least twenty-four inches (24″) deep. (i) At least one (1) for Buildings with three (3) or less Dwelling Units on any Building story. (ii) At least two (2) for Buildings with four (4) or five (5) Dwelling Units on any Building story. (iii) At least three (3) for Buildings with six (6) or more Dwellings Units on any Building story. (4) Vertical Elements. See Photo Group 3 for examples. (b) Corner treatments. See Photo Group 4 for examples. (5) Wainscot. See Photo Group 5 for examples. (a) Wainscot and trim along the entire Building facade. (b) The wall areas above and below the wainscot trim shall be of different colors and/or materials. (6) Windows and Balconies. See Photo Group 6 for examples. (a) Bay and/or box windows: at least one (1) in the front Building facade for each one (1) ground-floor Dwelling Unit. (b) Balconies: at least one (1) for each one (1) Dwelling Unit above the ground floor. (7) For purposes of this Chapter, covered Dwelling Unit entrances do not constitute horizontal articulation. (8) There shall be a roof overhang at the eaves and gable ends of not less than twelve inches (12″), excluding rain gutters, measured from the vertical sides of the Building. The roof overhang requirement shall not apply to areas above porches, alcoves, and other appendages. (iii) Lintels, of a color different than the wall sections surrounding the windows. (2) Windows on facades other than those described in the previous Subsection shall include trim, at least two inches (2″) in width, of a color different than the wall sections surrounding the window. (3) See Photo Group 7 for examples. (1) All open Building entries (i.e., without doors) shall be clearly designated with lighted directional and/or Building identification signage. (2) All closed Building entries (i.e., with doors) and Dwelling Unit entries located on exposed Building facades (i.e., not located on a breeze-way internal to a Building or between otherwise connected Buildings) shall be covered with a portico, pediment, or similar covering that is architecturally integrated into, not merely attached to, a Building. See Photo Group 8 for examples. Covers shall be of dimensions sufficient to cover one person standing at the entry. (3) All Dwelling Unit entries shall utilize trim, at least four inches (4″) in width, of a color different than the wall sections surrounding the entry. (4) Building entries shall be directly accessible from a publicly-owned sidewalk or a privately-owned pathway open to the public. (5) Buildings may not have stairwells or stair cases of more than six (6) stairs leading directly to or from Dwelling Unit entries. (1) All Project vehicular entrances shall include a signed, lighted entry monument identifying the Project. See Photo Group 9 for examples. 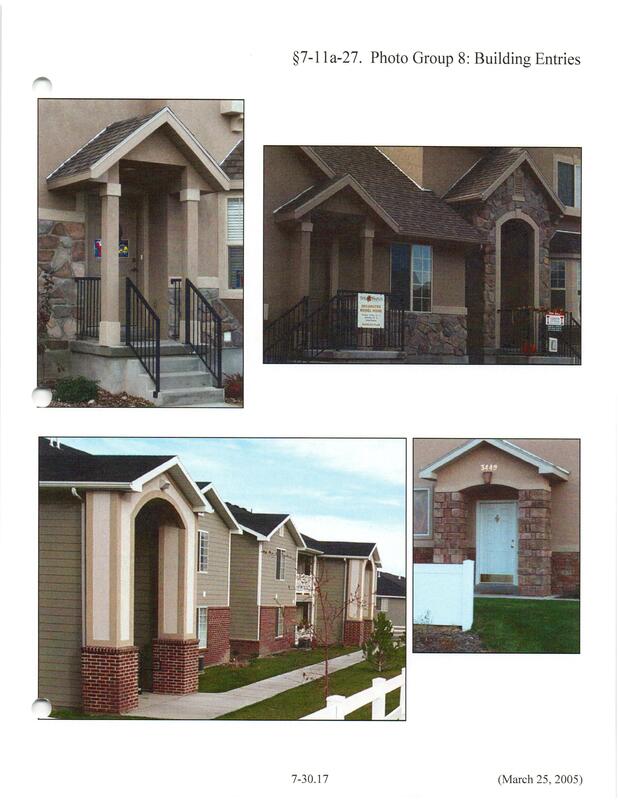 (1) Acceptable monument materials include rock, brick, masonry, stucco, and finished wood. (2) All monuments shall include unobtrusive lighting that illuminates the sign portion of the monument. (3) Monument sign lettering shall be solid and opaque. (4) Monument design shall incorporate a variety of plants, including ground cover, flowers, shrubs, and trees. (5) All Project entrances shall incorporate wheelchair accessible crosswalks. (1) Purpose: The intent of Project landscaping is to provide a variety of plant materials to give color and texture to the Project, to frame views, to screen undesirable views, and to create areas of public space that encourage positive human interaction. (2) Design. All landscaping shall be designed by a licensed landscape architect or similarly qualified licensed professional, and installed by a licensed landscaping contractor in accordance with this Chapter and general landscaping industry standards. (3) Perimeter Setback. All Projects shall incorporate a landscaped perimeter at least ten feet (10′) deep from all Project property lines adjacent to Surrounding Property. (4) Interior Setback. All Projects shall incorporate a landscaped area at least ten feet (10′) deep from all interior roadways. (5) Percentage. At least twenty-five percent (25%) of each Site shall be landscaped. This requirement may be reduced to twenty percent (20%) if at least twenty-five percent (25%) of the twenty percent (20%) landscaping is Dry-Scape. (ii) Four (4) shrubs per Dwelling Unit. Any one (1) shrub may be replaced by a grouping of at least three (3) perennial flowers. (iii) Trees, shrubs, and/or flowers shall be distributed evenly around the Building perimeter, except that a larger proportion of trees may be placed on the eastern and western sides of the Building. (i) One (1) tree grouping of three (3) or more deciduous trees per 1,000 square feet of Common Area. (i) One (1) tree per 1,000 square feet of Open Space. Trees shall be a mixture of deciduous and evergreen, and may include preexisting mature trees that are incorporated into Project Open Space. (iii) Four (4) shrubs per Dwelling Unit. (iv) Trees and shrubs may be grouped or clustered. (7) Types. Landscaping includes trees, shrubs, groundcover, flowerbeds with perennial flowers, Dry-Scape, and grass. Dry-Scape includes rock, bark, and other low-water landscaping materials generally used in the landscaping industry. New trees shall be at least one- and-one-half-inch (1½”) caliper measured at the base of the tree. (8) Projects shall be designed to incorporate existing mature trees (i.e., ten (10) or more years old, or four-inch (4″) caliper trunk measured at the base of the tree). The minimum required number of new trees in any Project area (i.e. Open Space) shall be reduced by one (1) for every one (1) existing mature tree incorporated into that area of the Project. (9) Landscaping used to satisfy any one requirement of this Section shall not be construed to satisfy any other requirement. Each requirement shall be satisfied independent of any other. (iv) Reduce wasteful and unnecessary water usage. (b) Trees and shrubs shall be located in similar water usage demand zones. (11) Maintenance. Each Project shall include the creation of an association, or other legal mechanism acceptable to the City, with responsibility for, and authority to require and enforce, the permanent maintenance of all landscaping in good condition and free from refuse and debris so as to present a healthy, neat, and orderly appearance. (a) Dead trees, shrubs, and other plantings shall be replaced within sixty (60) days, or by November 1, whichever is earlier. (b) Grassy areas shall be treated in a manner so as to discourage weed growth. (12) Parking areas. All landscaped areas shall be separated from parking and drive surfaces by a curb at least six (6) inches high. (13) Multi-family redevelopment projects within an existing registered historical building shall have no landscaping requirements specific to the historical building beyond those landscaping areas previously established with and around the building. Those previously established landscaping areas shall be developed according to the provisions of this Section. (1) Parking areas shall be contained with in the interior of the Site of under the Buildings. Parking areas shall be no closer than ten (10) feet to a public right-of- way. (2) Direct access to parking areas shall be from internal roads, not from a public road. (3) Parking areas of six (6) or more spaces shall be effectively screened from public streets and Surrounding Property. Screening may be with fencing, berming, or landscaping, which landscaping may be credited to the Open Space landscaping percentage requirements contained in this Chapter. (4) The predominant view from the public roads shall be Buildings, not parking areas. (5) Parking structures shall utilize materials, colors, and design similar to those of the nearest Building. (1) Tooele City Code Chapter 7-25, regarding signage, shall apply to all Projects except as expressly provide otherwise by this Chapter. (2) Building signage shall be designed as an integral architectural part of Building design. (3) Project signage. See the Subsection, herein, relating to Project Entrances. (1) Security and other lighting shall be sufficient to illuminate every building entrance, pedestrian pathway, and parking area, but shall not be excessive. (2) Theme Lighting. Lighting and light fixtures utilized throughout the Project to illuminate streets, pathways, parking areas, Building entrances, and Building facades shall be consistent and thematic in terms of their design, placement, and brightness. (3) Building lighting. Buildings shall be illuminated with a minimum of one (1) wall-mounted light fixture per ground-floor Building and Dwelling Unit entrance. (4) Building Area Lighting. Where any Building is located more than 30 feet from a public street, additional lighting shall be provided by way of free-standing lighting fixtures located in the Common Area, Open Space, and/or other area between the Buildings and public streets. The fixtures shall produce light at least the equivalent to light produced by a 100 watt incandescent bulb per each 50 feet of street frontage or fraction thereof. (5) Common Area. Common Areas shall be lighted to illuminate an area with a radius equal to the distance between the approximate Common Area center and the nearest Building by installing lighting fixtures that emit light at least equivalent to that of one (1) 100 watt incandescent bulb 200 feet in all directions. (6) Street Lights. If a pre-existing public street is not lighted, the Project Plan shall include regularly-required street lights. (7) Parking Areas. Each parking area shall be illuminated for safety by installing lighting fixtures that emit light at least equivalent to that of one (1) 100 watt incandescent bulb per 50 feet in all directions, with a maximum fixture height of sixteen (16) feet. (8) Lighting used to satisfy any one requirement of this Section shall not be construed to satisfy any other requirement. Each requirement shall be satisfied independent of any other. (9) Glare and shielding. All lighting shall be shielded so as not to shine into adjacent Buildings or Surrounding Property and to reduce glare and waste. (10) Light pollution. Lighting shall be designed and installed such that light will not spill into the Surrounding Property. All exterior lighting shall comply with Tooele City Code Chapter 7-30, regarding light pollution and waste. (1) All new utilities shall be placed underground. Pre-existing above-ground utilities located on the Project side of public streets, or on the Site, shall be relocated underground. (2) Pad-mounted transformers and/or meter box locations shall be screened with landscaping or building materials similar to Project walls, fences, or Buildings. (3) All utility connections shall be designed to be similar with the architectural elements of the site so as to minimize above-ground exposure and visibility. (4) Storm water detention and/or retention facilities shall be incorporated into, and be designed as part of, the landscaping plan. (1) The Project perimeter property line shall be fenced, except for the portions of the Project that abut a public street. (2) Perimeter fencing shall utilize materials, colors, and design similar to those utilized for Buildings. (3) Allowed fencing materials include natural or cultured stone masonry, brick masonry, split-faced block masonry, stucco, vinyl, and other similar materials. (4) All perimeter fences shall have vertical sections, such as columns or piers, spaced at regular intervals (i.e., between twenty (20) and 50 feet apart). (5) Prohibited fencing materials include chain link, barbed wire and other wire materials, wood, and cinder block masonry, except where covered by stucco or brick masonry. (6) Each Project shall include the creation of an association, or other legal mechanism acceptable to the City, with responsibility for, and authority to require and enforce, the permanent maintenance of all fences in good condition so as to present a healthy, neat, and orderly appearance. (7) Examples of allowed fencing materials and vertical sections are shown in Photo Group 10. (1) Siding. Exterior Building siding materials shall be natural or cultured brick or stone over at least ten (10) percent of the entire Building facade (not including windows and doors), the remaining 90 percent being brick, stone, stucco, clapboard, wood, block/masonry, and/or vinyl. At least 33 percent of the ten (10) percent shall be on the front Building facade. (2) Roof. Roof materials shall be architectural asphalt or composition shingles (at least 30-year), ceramic or clay tiles, or other long-lived weather-resistant materials. (1) Colors selected for Buildings, parking structures, dumpster enclosures, fences, and other structures and materials shall serve to achieve the purposes of the General Plan the this Chapter and shall take into consideration a Project’s Context and Setting. 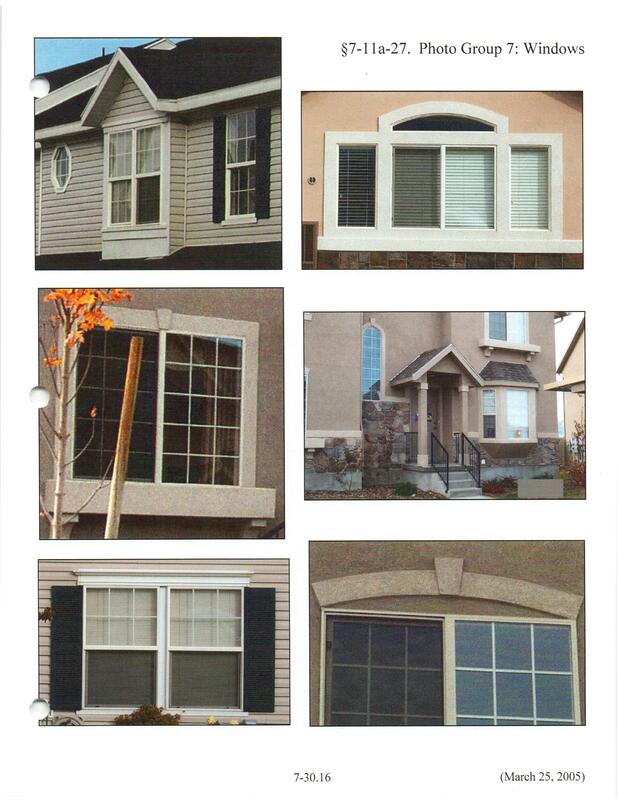 (2) Building facade colors shall be low-reflective, subtle, neutral, or earth tone colors. No sharply- contrasting, overly-bright, or obnoxious colors (e.g., hot pink) are allowed. (1) Where vents are utilized, whether functional or faux, on a Building facade, the vents shall be of the same colors, materials, and style as the Building facade upon which the vents are mounted, but shall be of a color different than the wall sections surrounding the vents, or shall be trimmed with a color different than the wall sections surrounding the vents. (2) See Photo Group 11 for examples. (1) Garbage dumpsters and receptacles shall be enclosed on all sides with opaque screening materials. For at least the three (3) non-vehicular access sides, screening materials shall be masonry (but not cinder block) or vinyl. Screening materials for the dumpster enclosure gate shall be vinyl or other solid, opaque materials. (2) Dumpster enclosures shall utilize the same colors and materials as the Buildings. (3) Dumpsters shall be located a minimum of 100 feet from any Building or Surrounding Property dwelling except within in the MU-B zoning district. Within the MU-B zoning district, dumpsters and waste collection shall be located within a rear or interior side yard and may otherwise be located as suitable to minimize noise, dust, odors or other nuisances. (4) Dumpster enclosures shall be located so as to not interrupt, encroach upon, or interfere with the Project’s vehicular or pedestrian pathways or parking areas. (5) Dumpster enclosures shall be designed to minimize the public view thereof by placement near the rear perimeter of the Project. (6) Dumpster enclosures shall include landscaping on at least two (2) sides. Landscaping shall consist of shrubs, vines, and/or Dry-scape. (1) Common Areas shall incorporate Design Elements that encourage frequent, safe use of the Common Area by Project residents and visitors. (2) Common Areas between any two (2) adjacent Buildings shall be of sufficient dimensions to accommodate pedestrian pathways, landscaping, and an eight-foot-long picnic table. (3) Common Area shall be landscaped in accordance with the Landscaping Design Standards, above. Common Area may include pathways, patios, recreational activity areas, picnic tables, pavilions, gazebos, and water features. (4) Common Area in Projects of twenty (20) or more Dwelling Units shall include a playground with play equipment designed to accommodate at least twenty (20) children. All play equipment shall be commercial grade and shall satisfy the minimum standards and specifications contained in the Consumer Products Safety Commission (CPSC) and the American Standards for Testing Materials (ASTM). Every additional twenty (20) Dwelling Units shall trigger the requirement for additional playground area with play equipment designed to accommodate an additional twenty (20) children. All playground areas containing play equipment shall include fall material to a depth of at least twelve (12) inches. The playground facilities are private Project improvements and shall not entitle the Project to a credit against City impact fees. (5) Common Area shall include functional Design Elements, such as, seating and tables for eating, and trash receptacles, which shall be accessible to the disabled and to children, and which shall be designed in relation to trees and tree groupings for shade and to pedestrian pathways for access. (6) Each Project shall include the creation of an association, or other legal mechanism acceptable to the City, with responsibility for, and authority to require and enforce, the permanent maintenance of all Common Areas in good condition and free from refuse and debris so as to present a healthy, neat, and orderly appearance. (1) In addition to Common Areas, Open Space shall be provided on the Site equal to 25% of the Net Developable Area. (2) Open Space shall be landscaped in accordance with the Landscaping Design Standards, above. (3) Each Project Plan shall incorporate areas for trails pursuant to any City master plan or capital facilities plan relating to trails. (4) Open Space may include pathways, patios, recreational activity areas, picnic tables, pavilions, gazebos, and water features so long as such surfaces do not exceed fifteen (15) percent of the minimum Open Space. (1) All improved pathways shall be wheelchair accessible. (2) Crosswalks shall utilize materials and colors different than the road sections that the crosswalks traverse. (3) All Sites shall incorporate continuous, wheelchair accessible pedestrian pathway that provides direct access to each Building, Common Area, parking area, and public sidewalk. 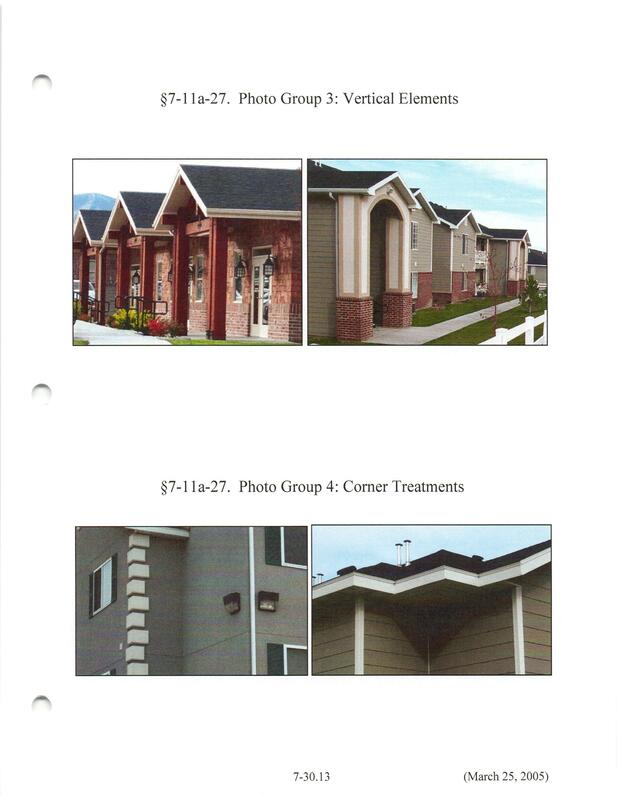 Cross reference Tooele City Code Chapter 7-14 for questions of zoning, including allowed uses, required setbacks, and maximum building heights.